On November 16, 2003 New Jersey K-12 Grade Championships were held in Lincroft, NJ. Almost 300 players participated in 13 sections. For the first time five of our students participated in these championships. And they had a remarkable success! - Arik Milner became Champion of New Jersey among 2-grade students with the excellent result - he won all 5 games (!) and received 1st place trophy. Together with his older brother Aviv, Arik started studying chess in September 2001, when he came to School Plus for the first time and started learning chess moves with trainer Nonna M. Karakashyan. 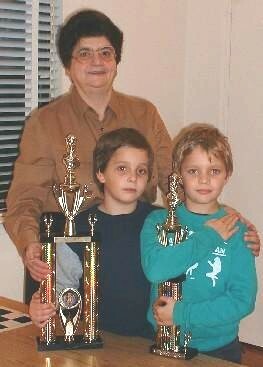 For these two years Milner brothers demonstrated a great progress, persistently studying chess theory with their trainer, participating and winning in many tournaments in New Jersey and Pennsylvania. This allowed Aviv and Arik to gain high USCF (United States Chess Federation) ratings. Today they are included in Top 100 chessplayers of the United States, each in his age group. 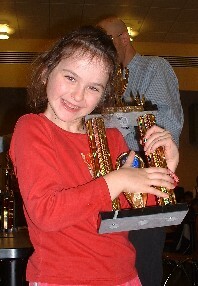 - Dina Shimanovich received 2nd place trophy in the same age group, among 2-grade students, with a great result - she won 4 games of 5! In effect Dina was first among girls of 2-grade statewide! Dina and Esther Shimanovishes also started to study chess with Nonna Karakashyan two years ago. Their progress is very impressive, from one tournament to another. - Aviv Milner and Mark Berns played among more experienced 4-graders and also won 4 games of 5. These results brought them 3rd place trophies! - Esther Shimanovich finished also with a good result - 3 of 5, being second among girls of 3rd grade competition and one more time increasing her USCF rating. Our congratulations to Arik, Dina, Aviv, Mark, Esther and their parents! We wish luck to Arik, Dina, Aviv, Esther in coming National Scholastic K-12 Championships that will be held in Rosemont, Illinois in December 12-14, 2003 !